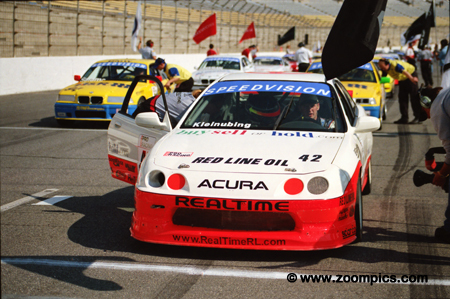 Pre-season favorites were the formidable RealTime Racing team and drivers Pierre Kleinubing, Hugh Plumb and Kevin Schrantz—all in Acura Integra Type Rs. The RealTime team lived up to their reputation – qualifying first and second. Leading the field into turn-one are Kleinubing and Plumb. Charlotte was the debut of the series newly introduced standing starts. Pierre Kleinubing had performed standing starts in his native Brazil. He used this experience to jump out front and led flag-to-flag. After 26-laps Kleinubing in his, Acura Integra Type R won by 0.481-seconds. 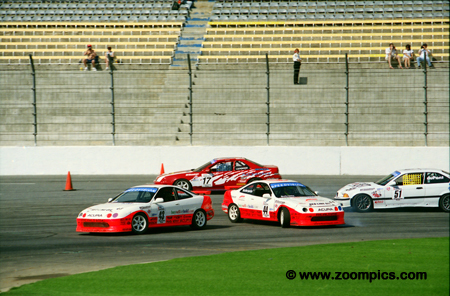 RealTime boss Peter Cunningham was entered in the Touring class by the Prototype Technology Group. The plan was to convert the No. 41 BMW 328is to World Challenge GT trim for the remainder of the season. Cunningham started last in Touring race but was eighteenth by the end of lap-1. Despite struggling with a leaking tire late in the race, he finished third. During his charge to the front, he recorded the fastest race lap. 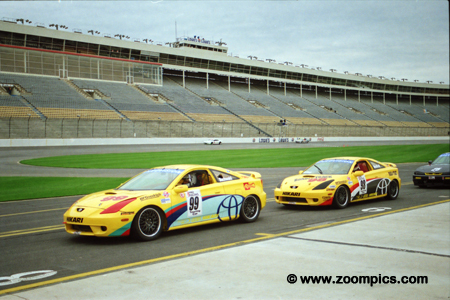 The Hikari Racing Toyota Celicas. The No. 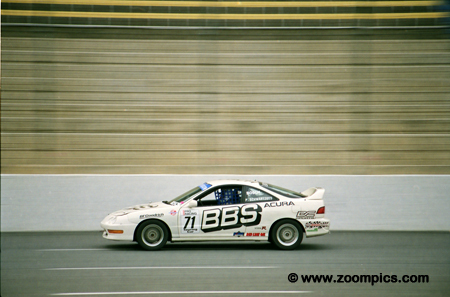 99 was driven by Kurt Buchwald who qualified a respectable fifteenth but retired with mechanical problems. Kim Wolfkill in No. 98 completed only 5-laps after starting thirty-fourth. 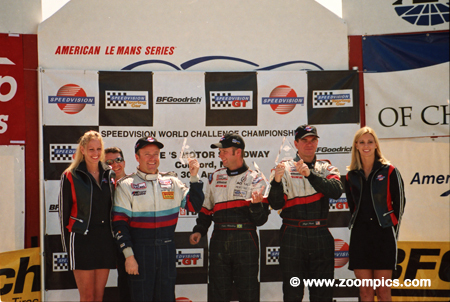 Unfortunately, the team had very little success and the cars vanished after the 2000 season. 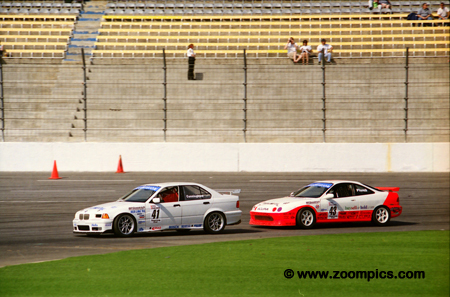 TC Kline entered three BMW 328cis in the Touring division for drivers Mike Fitzgerald, Neal Sapp and Shauna Marinus. Unfortunately, the cars were not ready for the opening round at Charlotte. 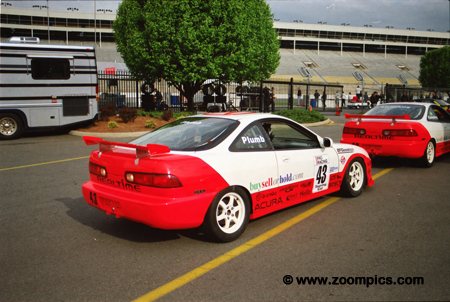 Wanting to score points arrangements were made for Mike Fitzgerald to drive Peter Schwartzott’s Acura Integra Type R. He started eighteenth but an accident led to his retirement on lap-13. Number 17 Grant Lockwood in a Honda Prelude takes evasive action as Kevin Schrantz in the No. 44 RealTime Type R and Alfred DuPont in the BMW 328is make contact. Schrantz’s teammate Hugh Plumb in No. 43 went on to finish second. Hugh Plumb drove the No. 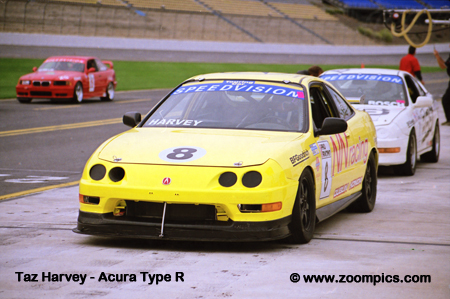 43 RealTime Race Acura Integra Type R. He qualified behind the pole winner and teammate Pierre Kleinubing. Plumb fell to third at the start and eventually fourth behind Will Turner and Peter Cunningham as he struggled with a car that was down on power. In the second half of the race, the problem corrected itself, and he was able to improve his position - finishing second. Will Turner drove the No. 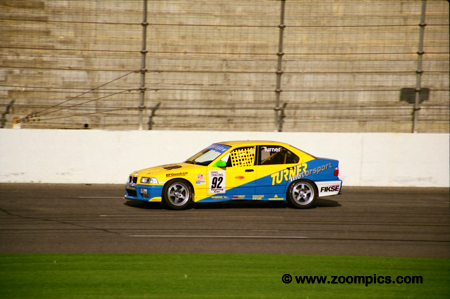 92 Turner Motorsport BMW 328is. 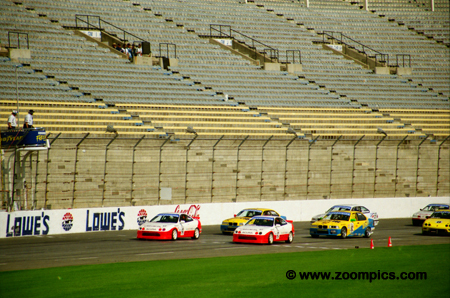 His team included drivers – Don Salama, Brian Wade and Jeff Tarr. Turner and rookie Salama started third and fourth, respectively. At one point during the race, Turner was running second but eventually he was passed by Plumb and Cunningham and finished fourth. Despite the fact that third place finisher Peter Cunningham was entered in a BMW 328is by the Prototype Technology Group this was primarily a RealTime Racing podium. In the center is the winner, Pierre Kleinubing and to his left is his teammate Hugh Plumb.